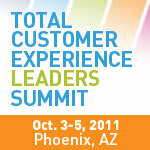 Earn a complimentary All-Access pass to Total Customer Experience Leaders by serving as a guest-blogger. As a guest blogger, you’ll have access to TCEL's comprehensive customer experience agenda attracting the best in insights from around the world. Unpreceden ted in size, scope, breadth, depth and participation, this is truly the best event the industry has ever seen. Growing out of our past Linkage Strategies Event, Total Customer Experience Leaders is about integrating the voice of the customer into disparate pieces of customer research data within B2B and service oriented B2C companies. This year brings you innovative keynotes, including client-side experts and award winning authors on creating a customer centric culture, the practice of storytelling, leveraging senior leadership and discovering authentic experiences, a diverse group of leaders share industry specific case-studies, our Social Media CRM Symposium Day, interactive forums and more. By participating as a guest blogger leading up to and at the event, you’ll receive an all access pass for the entire event, taking place October 3-5, 2011 at the Renaissance Phoenix-Glendale Hotel & Spa in Glendale, Arizona. Responsibilities will include attending specifically assigned sessions and blogging live or same day as well as writing content for our exclusive executive summary. In exchange for guest blogging, you will receive an all-access pass to the event – a $3,000+ value. Guest bloggers are responsible for their travel and lodging. Apply today by sending your name, company, biography and links to your blog or writing samples if applicable to Michelle LeBlanc at mleblanc@iirusa.com.